According to the buzz, Tour Edge had come up with something really special in the Exotics CB Pro fairway and starting with the packaging it was evident they agreed. Rather than the usual slim cardboard carton holding a club muffled in bubble wrap, the CB Pro was inside a carton inside another carton with the club suspended in multi-layer pasteboard brackets. There was even a pasteboard tube to secure the Stitch head cover. Clearly Tour Edge considers the CB Pro to be out of the ordinary so I was looking forward to “test driving” this latest from the company that built their reputation by making really top notch fairways and hybrids. “Test driving” new clubs, especially drivers and fairways can be done in several ways but I prefer to do it on the course. A golf simulator is fine and the computer data is useful but on-course conditions cannot be duplicated even by the most sophisticated software. Testing on the range is an improvement since wind and lie and stance mimic actual playing but even with a radar measurement device you still can’t walk out and see for yourself. And you can add to my list of prejudices, the same is true when comparing one club to another. Call me old-school but the proof of a club’s performance is on the course not on the range or in a simulator. So, after being appropriately appreciative of Tour Edge’s packaging the next stop was the course. 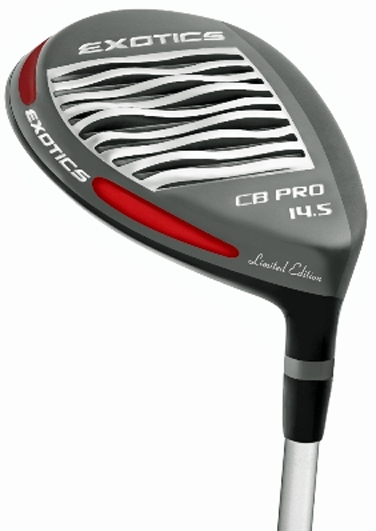 The first thing you notice is at address is the CB Pro head looks smaller than recent Exotics models like the XCG6. At 170cc the size and shape look good behind the ball and could even be called confidence inspiring. There’s also a new sole design that Tour Edge says helps keep clubhead speed at impact by tending to glide over the turf rather than digging in and looking at divot depths this certainly seems to be true. The titanium cup face is combo brazed to the stainless steel body, a process used only by Tour Edge, and clubhead weight has be moved closer to the face to favor a lower ball flight. As it happened the first two rounds with it in the bag were played with a 10-plus mph wind but since the CB Pro does produce a nice flat trajectory it meant the ball could be controlled even when across the wind. Because of the wind (and playing in the rain on one occasion) it wasn’t until the fourth or fifth round I really came to appreciate how long the CB Pro hit the ball. It had felt good, solid from the start, but the fact that even with a flat trajectory there was enough spin on the ball to keep it in air without a tendency to balloon meant the result was really good distance. Gaining confidence I started using it from the tee on tight holes and though it certainly isn’t as long as a driver it did what you want the most when using a 3-wood instead of a 1-wood, it “thread the needle” when called upon. There’s no question the Exotics CB Pro should be at the top of your list for consideration if you are in the market to replace your present fairways. It comes in a choice of five lofts between 13.5 degrees and 17.5 degrees with either the Fujikura Speeder 661 or 757 Series shaft. At the beginning I said Tour Edge thinks this club is something special. The packaging was an indication of how special but the company is only making a limited number of the CB Pro and, risking “sticker shock,” has set the retail price at $500.